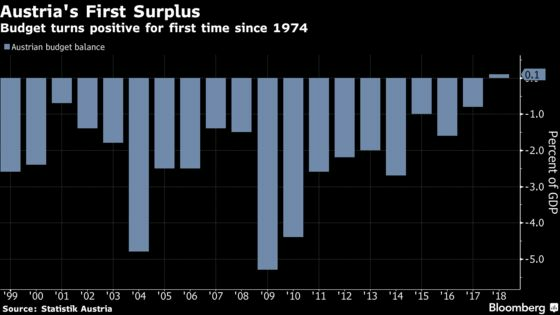 (Bloomberg) -- Austria had a budget surplus for the first time since 1974 last year as brisk tax revenue growth outpaced expenses. Finance Minister Hartwig Loeger predicted a slight deficit as recently as December, but he ended up with a surplus of 426 million euros ($480 million), or 0.1 percent of gross domestic product. The ministry didn’t provide the result for the structural budget balance -- which tries to adjust for the economic cycle.